Although the official launch of Google and Samsung's first Ice Cream Sandwich phone is still a few hours away, Japanese carrier NTT DoCoMo has prematurely confirmed the existence of the Galaxy Nexus. 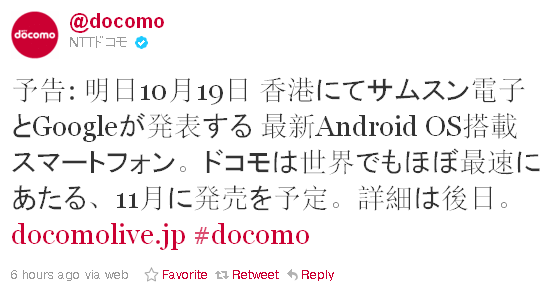 In a tweet sent out a few hours ago, @docomo stated that it would be "among the fastest" to launch the handset, when it becomes available in November. Rumours have already surfaced indicating that Google's latest flagship phone will come to Verizon on November 10th and will cost $299.99. However that is more likely to be the earliest possible launch date and there has been no confirmation of these rumours. In any event, in a few hours the Galaxy Nexus will be revealed and more details may emerge. Don't forget to follow the live blog of the entire event starting 6.30pm PDT.